As a Hove chiropractor we are committed to patient education and understanding, which is why we like to explain everything in advance! Here is what you can expect when visiting Chiropractic Life . Please allow at least forty five minutes for your first visit to our clinic and we ask that all new patients arrive fifteen minutes early to complete the health history so that they will be ready to see the chiropractor at the appointed time. Our friendly front desk staff will welcome you and make you feel at home. A simple gown which has a back opening is provided for your examination. Your consultation and examination will be conducted in private and we have an x-ray facility on site should these be recommended. Payment is required at time of service as we do not run accounts. We accept cash and have card facility. Due to banking changes we no longer accept cheques. The second visit to our clinic is called the Report of Findings visit. Again, please allow thirty minutes for this appointment. 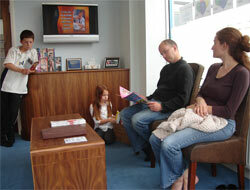 During this visit you have the results of your examination and x-rays explained to you, if you had any x-rays taken. Recommendations are made for your care or referral to another health practitioner will be provided. Time has been set aside for you if you will be proceeding with care on the day. Financial arrangements will be discussed at this time and considerable discount is available for multiple appointments. Water is provided for your comfort – please take advantage of it to keep yourself hydrated as this is beneficial when having your adjustment. We endeavor to always be on time for your appointment, however sometimes due to circumstances beyond our control, there may be a short wait. Please bear this in mind when sourcing parking in local streets as local parking attendants frequent this area. Contact our Hove Chiropractic office and we’ll arrange a consultation with one of our experienced chiropractors. Call today, we can help!